The importance of using a stop-loss order cannot be overstated. As W. D. Gann wrote in the 1930’s, if you do not use stops, it is not a question of whether you will go broke, but a question of when. This is because the market is hyper-sensitive to external shocks and can move a hundred points an hour — against you. These are named Black Swan events because they seem unthinkable before they occur. But you do not need a Black Swan event to suffer a catastrophic loss. The use of leverage in Forex magnifies losses. 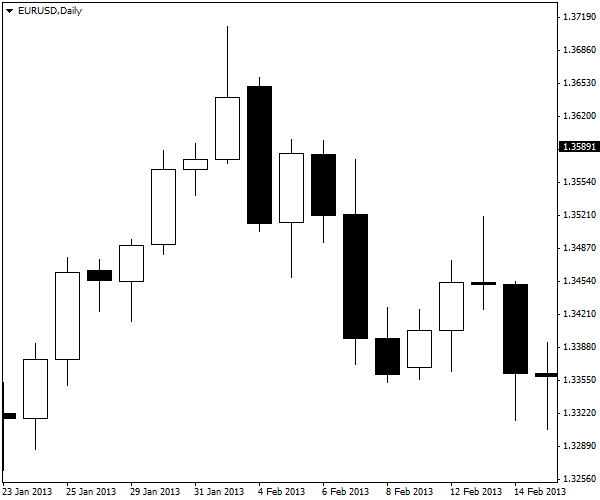 Prices in the Forex market do not move in a straight line. Even a strong trend has multiple pullbacks, and you never know when a pullback starts whether it will be a minor one or a major one that becomes a full-blown reversal. 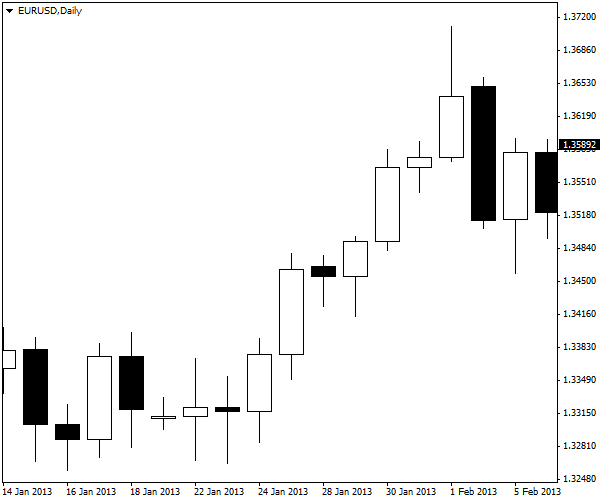 Can you tell whether this is a minor pullback on the chart below? No longer looks like some minor pullback. It is obvious that it would be better to exit earlier in the emerging downmove than later. A stop early in the move would leave you enough of a stake to continue trading. Exiting near the end of the move, when it has finally sunk in that this is no ordinary pullback, could wipe out all your trading capital. You may think you will watch prices like a hawk and will place your order to exit — a mental stop — when the price goes against you, but in practice, it is very hard to exit on mental stops. You imagine that in just a few more minutes, the price will return to the trend. This is named the “It will come back!” excuse. Or you know perfectly well what is causing the reversal against your position. In your judgment, the reversal is not justified. But the market is not interested in your judgment. The market may be completely irrational and wrong, but you need to remember that the purpose of your trading is not to be right, it is to make money. Both of these situations may seem like rational thinking, but really they are excuses for letting emotion rule your trading. Another reason some traders give for not using a stop is that the brokers will know where you have placed the stop and go hunting for it. This is the reason given by famous hedge fund trader Victor Niederhoffer — who has gone broke twice. Granted, his positions were large and he may well have been a target. But he went broke twice because he did not use stops and experienced sudden catastrophic losses. Which is worse — being outsmarted by the brokers or going broke? It is no doubt true that brokers and others do hunt for stops in the effort to force your exit so they can buy more cheaply or sell more dearly a little later. But realistically, no one needs to know your exact stop-loss level (except perhaps a particularly venal broker). Stops are placed at any of a limited number of technically logical places, including support and resistance lines, Bollinger bands, and Fibonacci levels. Anyone with a chart can see where stops must be clustered. Not placing a stop-loss order just because someone else may guess its location is to cut off your nose to spite your face. When the market decides to go gunning for longs or shorts in any particular situation, the intelligent tactic is to get out of the way. The key reason to use stop-loss orders is to fulfill the needs of a rational trading plan. In a good trading plan, you know in advance what your gain/loss ratio is likely to be. Not down the last penny, because the market will always manage to deliver surprises from time to time, but with some accuracy. Let’s say you want to make $2 for every $1 you lose. The only way to achieve that goal is if you have realistic profit targets that end up getting met most of the time in live trading, and a stop-loss regime that limits losses to 50% of gains. Over time, a plan like this will deliver a steady accumulation of capital. Stop-losses do have drawbacks. First is that an event can come along out of the blue and cause a gap or big move so fast that your stop-loss order does not get filled at the level you specified, but at a far worse level. And then, after you got stopped out, the price turns around and returns to its previous trajectory — but you are out. This is galling and annoying, to be sure, but one of the facts of active trading that you have to swallow. To complain about getting stopped out on a temporary shock is like complaining that the fire in your house did not destroy more than the amount of your deductible. Another drawback is that you get stopped repeatedly on pullbacks. This is not the fault of the tool but of the operator. Repeated stops mean your stops are placed at the wrong level, or you are trading the wrong currency pair, or you are trading the wrong timeframe. If your stop is 15 points in the one-hour timeframe but the average high-low range over a series of many hours (over many days) is 30 points, you are risking being stopped out inappropriately. Finally, you may think the solution to not telegraphing your stops to the world is to have a mental stop and a system of alerts on your PC, your phone, or some other wake-up device. But what if your dog has an accident and you have to rush him to the vet, or your stove catches fire, or the electric power goes out? Chances are your stop will not be uppermost in your mind in an emergency situation. Just set the stop when you place the trade. 1. Stop-loss orders are an optional frill. 2. Why do we we need stop-loss orders? Catastrophic shocks are not all that rare. We need to know our potential risk size. His positions were too big. He refused to use stops. He was trading the wrong securities. 4. Brokers and others are hunting for your stops. Topic 01 - What Is Risk Management?